At SIM, we facilitate work-integrated learning not only within the classroom where students are encouraged to create meaning, manage, and reflect on their learning but also outside the classroom through practicums, paid opportunities, and student groups. Furthermore, many programs exist, on and off campus, for students wishing to certify their leadership skills. Talk about an opportunity! INFO 0590.00 Practicum is a required, non-credit course for all MLIS students. In combination with required MLIS course work, the placement in an information setting is an essential element of the school's curriculum, and is a key element in the professional training for information management students. 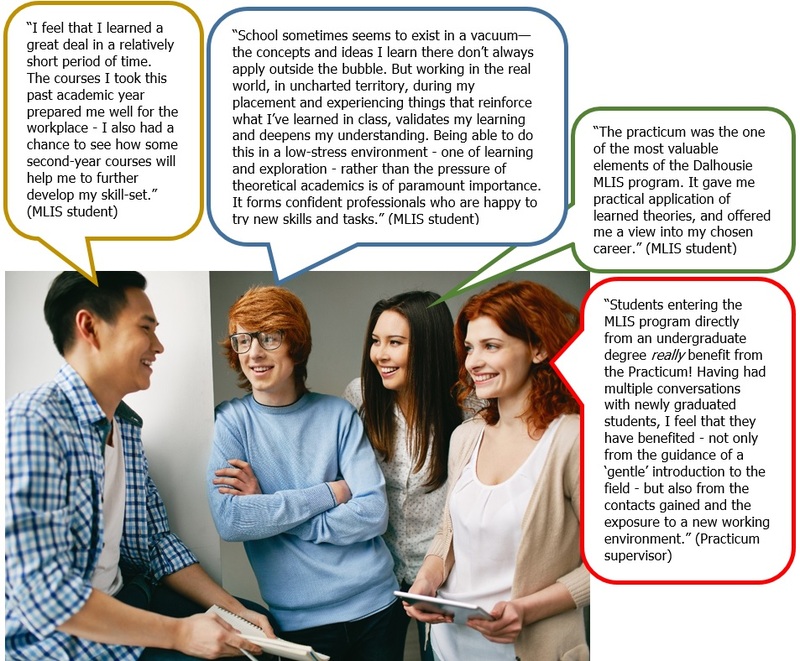 MLIS students report that the Practicum eases the transition from coursework to employment, not only giving them a chance to apply what they have learned in the MLIS program, but also providing valuable networking opportunities. To provide MLIS students with some income and additional professional experience during their program, the local community (e.g., Dalhousie Libraries & Archives, Saint Mary’s University, Public Safety, Public Archives of Nova Scotia, and New Brunswick Public Library Service) offers our students competitive employment/internship opportunities each year. Additionally, competitive student, teaching, and research assistantship opportunities and marker positions are forwarded to MLIS students. PPD sessions are a unique service provided to our MLIS students by Management Career Services (MCS). More information can be found here. Student groups provide further opportunities for students to gain valuable communication, organization, and management experience and build their networks. SIMSA provides a forum for Dalhousie’s MLIS students to share information and coordinate various ideas and talents among the school and the wider Faculty of Management. SIMSA is designed to promote good relations and exchange of ideas between the students and faculty, as well as with other graduate students on campus and the professional community. Students can assist with the planning and execution of the conference by serving as co-chairs or chairs in the following areas: programming, logistics, fundraising & finance, registration, web and communications. DJIM is a student-led initiative aimed at publishing Dalhousie graduate student work of the highest quality and significance in all areas of management. Students can serve as members of the editorial or technical team. The YA Hotline is one of the oldest YA journals in the world. Since 1977, the YA Hotline has been researched, written and produced by Dalhousie School of Information Management students enrolled in Services and Resources for Young Adults (INFO 6250). The newsletter contains information and resources for young adults and young adult librarians, including book reviews, resource lists, bibliographies, feature articles, interviews and more. Each issue explores a different theme of interest to teens and practitioners in school and public libraries. YA Hotline celebrated its 35th anniversary with a dramatic change of format. It is now available online free of charge. Twenty back issues (dating to 2005) have been archived and digital issues from 94 onward are available on the website. Questions and comments can be sent to YA Hotline Editor, Vivian Howard (vivian.howard@dal.ca). There are many programs offered on and off campus for students who wish to certify their leadership skills. These are a great addition to any resume. The CCR is an official document from Dalhousie that will recognize students' accomplishments and the experiential learning that occurs outside of the classroom, including campus-life and community engagement, volunteer and service leadership and awards for exemplary contributions. DALConnects is a free program that allows students to turn volunteer hours into a leadership certificate. The program offers several paths and levels to choose from, allowing you to tailor the experience to your interests. This is a free 10-session course offered by Halifax Regional Municipality (HRM) Volunteer Services. The course covers a wide range of topics and is intended to help you develop leadership skills and build strong communities. Futurpreneur helps aspiring business owners aged 18-30 launch successful businesses, through financing and mentoring.